A former drug worker has said Oban needs to wake up to its drug problem after bags of dirty needles were dumped on a construction site. Used syringes – linked to heroin abuse – were found by workers at the site in Glenshellach, just feet from newly completed homes where children play in the street. On the first occasion between 20 and 25 needles were found in a black bin liner, which had been ripped open by seagulls. The needles were strewn across the site. The same thing happened on Thursday, this time with between 12 to 15 needles. 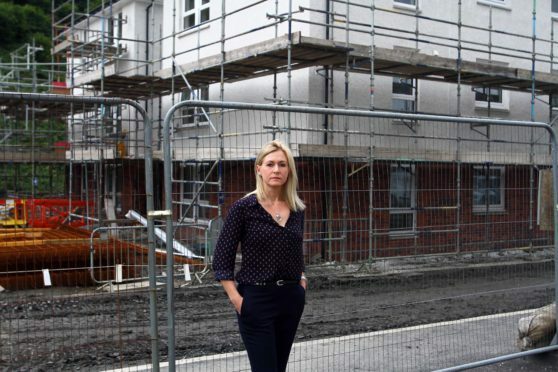 Oban Councillor Julie McKenzie, who used to manage a local addiction support service, lives nearby and was approached by staff from MacLeod Construction who are working on the site. She said: “This is of huge concern to the MacLeod workforce and all the residents in the area. “Nobody should have to go to work to be faced with the risk of a needle stick injury and the possibility of contracting a blood borne virus. “Dirty needles pose a major public health risk and when they are found feet away from a residential area where children play, it’s time for an urgent strategic response. “It is about time that Oban woke up to this issue. I think a starting point has to be a mapping exercise to establish the nature and true extent of the problem. This piece of work is long overdue,” she added. Jane MacLeod, company secretary of MacLeod Construction, said: “This gives us a huge health and safety concern for the welfare of our workers. “The needles were in a black bin bag that was thrown onto the site. The site is being used for social housing for Argyll Community Housing Association (ACHA). The council has advised anyone who finds a discarded syringe or needle in a public place to avoid touching it and report it to the authority on 01546 605 522.